Customizer Spotlite: Lachlana | Doll-Lite! 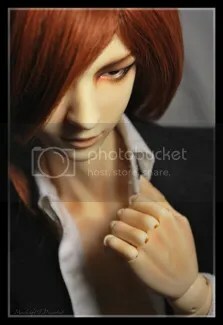 I think I knew when I bought my first boy that painting and customizing BJD was where I wanted to go. 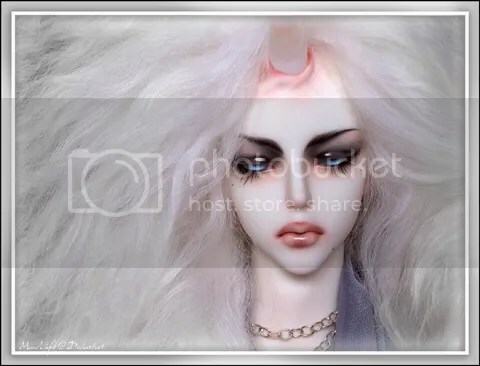 I’d been an avid pastel portrait artist who’d done a lot of work in watercolor and oil as well and had more than dabbled with sculpting portrait busts and character statues—BJD seemed like a natural progression just shy of being the doll-crafter I’d always dreamed of being. I spent so long just staring at my first boy’s faceup (in awe), studying every stroke and line and patch of color and imagining my strategy for painting one. It took me about a year to get started—a friend of mine thrust her Dollzone boy upon me and asked if I’d paint him. I’d never done a faceup before, but I had faith in my background and the poor boy needed some help. I had a lot of fun going through the process and was happy enough with the outcome (and so was she) to want to actively pursue it. So I went and bought a floating head. (I actually bought a mold I wanted as a doll and not just a practice head.) I really adored the way he turned out—however the very day after I painted him he had an accident and face-planted into the floor, destroying the MSC on his nose. I was absolutely devastated. I cried for three days while trying to repair him, but the more I layered on the MSC, the worse he got so I had to concede to wiping him and doing him again. (Because I was a noob) I used alcohol to remove the faceup—it took me hours worth of scrubbing but when I at last repainted him, I’d taken note of everything I hadn’t done well enough the first time (like cleaning the pastel dust away from the nose crevices, blending better, etc) and tried to improve. It’s years later, and this boy still has that same faceup even though I’ve come so far—I still like it. Lips. I‘d say lips are my specialty. When I was a child I’d go through my coloring books and color all the lips first. 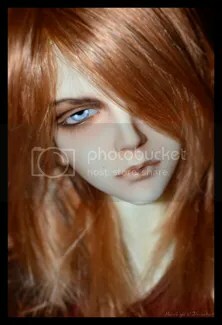 With BJD I paint the whole face LOL, but lips are still my thrill. I love the pouty plump lips best. Let me paint a doll with a plump, pouty pucker and I’m a happy beast. I’d like to at last venture into airbrushing. It’s something I’ve stayed away from because of time and equipment investment reasons, but I’ve always wanted to learn. And I know it’s going to be a learning process, and I’m not sure it will achieve the looks and control I currently have with pastel, and I’m not sure just how sane I’ll be going through it when the airbrush decides to spit on a nearly-finished faceup LOL—but I’d still like to try it. Lately I’m enjoying the realism effect. A few years ago I would scrunch my nose at applying too much blushing to a head, there was always an element of the stylized in my work—I had rules to never paint the nose, to stay inside the lines with lips, to leave the jaw and chin alone. Lately, I broke all those rules. The last handful of dolls I’ve painted for myself have blushing all over the place, around the nose, the mouth, the chin, the jaw—on the forehead. I’ve even added veins in the temples—not morbidly, but just faintly there. I like making the ‘skin’ appear soft and plaint, I like super-tender fingers and toes in graduated pinks and stuff of that nature. And then building over a very solid style of blushing the other elements of the faceup, usually finishing with some skin texture or freckles or beauty marks—things I know a lot of collectors aren’t terribly fond of. But I really like blending the separation between ‘doll’ and ‘portrait’ in the faceup these days. That’s what I’ve been enjoying. Sdink (Cheryl) is a huge influence on me in terms of inspiration, aesthetics, molds and always striving to improve on my work. I’m a big admirer of kamarza, alientune & Blueoxyde’s work. Blueoxyde has done some truly phenomenal customs with her Zaolls—her vision and execution is so inspiring. And I’m positively amazed by everything Jubriel produces. The extent of her talents, from faceups to costuming to photography supported by the elaborate backstory and designs of her characters is nothing short of stunning. The same can be said for Candygears who always floors me with any projects that involve her Mr. Have and Clean Slate. Her diorama for Uncanny Dream 2011 especially is absolutely jaw-dropping. Citronrouge has incredible vision and ability to execute that vision, her works are so dark and such a superb example of the “beautiful-grotesque” which I adore. But there’s really just so much talent out there, it’s hard to quantify it and I know I’m leaving people out. The freedom. Both creatively to try and experiment with new looks and repaints more often and not having to hunt someone down to realize a vision for you. There was a definite turning point where I stopped buying just dolls I liked and started buying the ones I wanted to paint. To this day, the dolls I purchase and put on layaway are usually dolls where the very thought of painting them excites me. It’s rare I go into a sale without a reason that involves customization and faceup potential. What’s the most difficult thing about doing customizations (your mods, face-ups, tats, etc) and altering them? Altering them? I’ve run into that quite a few times. Lisander, my half-statue boy began as a full facial reconstruction, but midway through I realized that my sculpting technique just wasn’t up to par, so I ended up carving most of what I’d done off of him—which is how he ended up with stone work. More often than not I’ll paint a face and not be satisfied with it, and immediately wipe it and paint it again. I just did that with my IOS Sezz—he was nice, but now he’s much better. But that’s personal criticism at work. Sometimes it’s a case of gloppy eyelashes, I’ve ruined whole faceups because I went too heavy-handed on the paint and had to start from scratch. So the difficult thing in altering is really the time it costs to repair what was already done and turn it into something better. I don’t have a lot of time to begin with, so when I spend hours working on something just to have it all be for naught, I get angry. Then I get over it, and do what needs to be done usually to much better results. I’m on a realism kick these days. I enjoy a nice natural faceup with dramatic eyes and plump lips. It’s fun to paint the more stylized and elaborate types (like my recent Iple Carina) but I find it more challenging and I’m not always taken with the result. Someone who has a really mean talent with wig making/styling and clothes making. eclipse21 comes to mind immediately as a wig-maker. I’d love to collab to create a really wonderful full set doll. That would be truly fantabulous. I think it’s the whole element of bringing characters to life. Creating these 3D avatars, making them life-like, having this interactive artwork to hold in your hands and mod and play with and shoot. It’s not a painting on the wall you just stare at, it’s something more tangible. 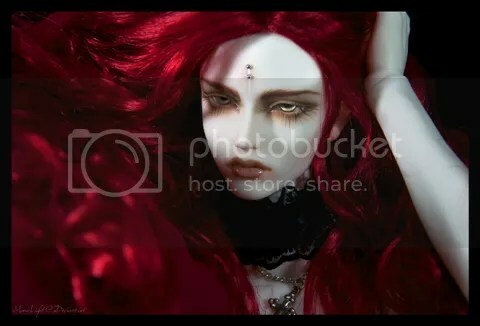 I’ve always been drawn to dolls and figures and statues—the 3-D medium coupled with my inexplicable need to push for realism just comes into perfect harmony in the BJD world. Back when I was sculpting my own characters in high school and pouring over doll-making magazines I don’t think I ever could have imagined something like this. It’s so fulfilling for me. 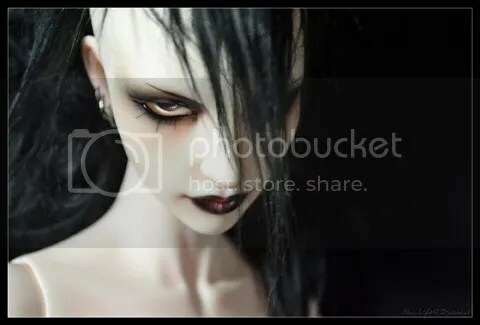 A typical doll I’d consider to be slight mods (usually some face sanding), a faceup & full body blush with mani/pedi and often skin texturing. In crunches, I’ve done it in 10 hours—at least I recall clocking one on Facebook at 10 hours (I think it was Gerard). I do often find I work in crunches though, as my work and social life don’t really permit me relaxing doll-painting streaks. I work on weeknights after I come home into the wee hours of the morning and have notoriously crawled into bed at 4 and 5 am to finish a project only to get up and zombie myself to the office the next day. And then do it again. Ultimately I want to produce what will make my client happy. They’re sending their doll to me to realize a vision they have, so I ask for as much detail as possible. I’m very visual, so visual references help me tons, whether they’re pictures of real people or other dolls, I like to really get in there and see what the client is thinking aesthetically—what appeals to them and I can better translate that visually. I had a lovely client send me a movie once to watch so I could fully gauge the look of the character who resembled the main actress and that was awesome. It helped loads because the look and attitude sort of go hand-in-hand. It’s great to paint a nice faceup, but to really have it translate that doll’s character (which I’m all about) it takes some extra consideration. I don’t copy faceups however, but I will seek visual reference to understand a certain style the client is after. 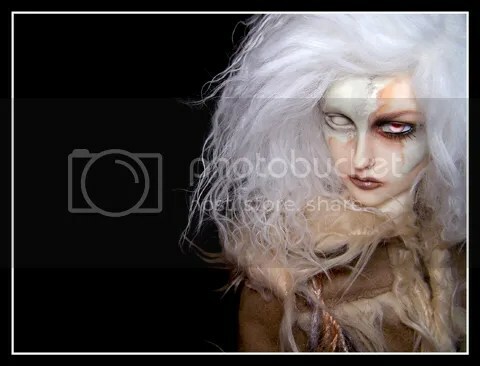 At the same time, I feel that I will produce a better faceup if a client does allow for my creative interpretation in addition to everything else. I have certain quirks in my style I always fall back on, and I will always use unless I alter them myself—so if someone is going to commission me I’m assuming they like my style and I will apply my style as I see fit. I try to give them character in their design and the way they photograph. That’s what I’m about, character. I want other people to look at members of my crew (or dolls I’ve worked on for other people) and see a story in their face, to imagine that there’s more than just resin there, there’s intelligence, cunning, sexuality, humanity, what have you. I want people to look at a photo of a doll I’ve worked on and be able to read the deeper character traits and personalities. I feel a lot of my dolls have that quality and I think that’s what makes them unique. At least they do to me. Too many. I have a long line of my crew and my partner’s crew waiting for various aesthetics, tattoos and mod work. I think in terms of full projects, the most immediate one I can never seem to get going on is Beyond’s body work. I’m designing for him to have a corset piercing and I want to mod him with epoxy to make it seem like it really is his skin being stitched into. On top of that, he has oodles of ink that needs to be done on top of a general body blushing that needs to be a bit more decrepit than the norm—but in subtle ways. So while I’ve been putting thought into him, I can just never seem to get the gears going on this guy. And he’s one of my favorite dolls and faceups too. My poor Bertram, Adonais Muse. I lusted after an AiL bertam for about 4 years before finally getting one, and almost immediately I decided to mod him. It was such a sudden impulse decision that I jumped in without really considering what I was doing and spent many hours sanding facial bone structure into this boy. 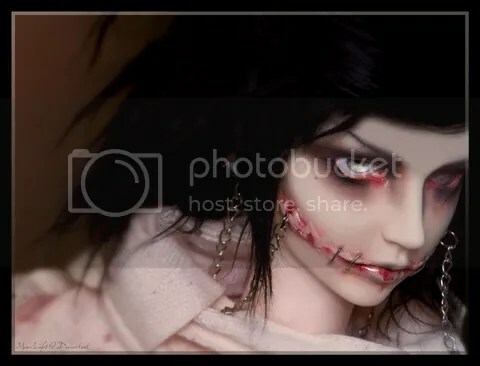 I wanted him to look real, and I gave him a very realistic faceup, I smattered it with skin texture and freckles and beauty marks and invested in glass eyes (which I wasn’t in the habit of doing often) and when I sat back to drink him in—I wasn’t happy. It was sort of like a Frankenstein situation, where I thought I’d made every feature lovely on its own, but together he just looked wrong. So I fielded for feedback (and had a nervous breakdown because by then I was convinced I’d ruined a lovely little boy) and after deliberating on him for 24 hours (and impulsively buying a second Bertram as a replacement) I went back to rework him. Some of my blushing, coupled with the extreme sanding made him look emaciated, and since I hadn’t modded his eyes, which on a plumper face looked proportionate, with the narrower cheeks and jaw I’d given him, they looked immense. And I’d painted his mouth wide—so he had this realistic faceup with a wide mouth and giant eyes and gaunt features. I reworked his blush and paled him out and let him sit that way. I tried to photograph him often to find his angles and convince myself he looked good. And I think in some ways he did—there is one photo in particular I still really adore, but the hair is covering part of the mod work and it makes all the difference. So after several months I’d determined all the problem areas and put him back on the slab to completely rework again. I wiped his faceup and added modeling compound to flesh out his gauntness. I also modded his eyes smaller, and when painting him, I was careful not to paint the full mouth, but sort of custom his own lip shape. He still has imperfections, because this boy has had a lot of work done, but ultimately I think he looks much better now. He’s taken a few really lovely photos and his character is greatly beloved by my partner and I, so even after all he went through, he’s one of the more special members of the crew. I still think I was nuts to even do as much as I did in the first place. But I learned a lot about modding, and my Gerard Way AiL boy really reaped the benefits. Definitely. I think it went from ‘hey, I can paint this doll’ to really trying to visualize what I wanted beyond just slapping on some color and doodling an arching eyebrow. I did okay faceups at the start, but I wanted to really explore what called to me in terms of style and develop my own techniques to really achieve it. I think I did a lot of gothy stuff in the beginning because that was sort of status quo for me, but I found that I was more drawn to natural looks, realistic looks, and small details like plump lips instead of hard lip lines or that one strip of color down the bottom lip which I was doing a lot out of habit. I think I’ve learned to layer color better, how to make gothy faceups look more real and less Harlequin, how to do minimal without being minimal about doing it. I just want to keep improving. There are so many things I still want to try, but I don’t just want to try them, I really want to succeed at them—and then do better.